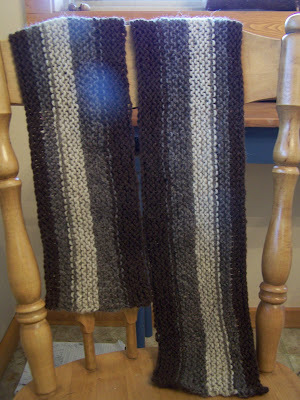 We still have snow up here in the woods and so I decided I wasn't too late in making S a woolen scarf. 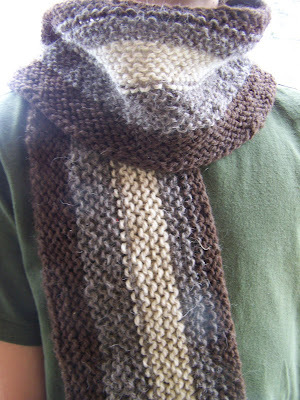 I'd had my eye on the Men's Rustic scarf in Last-minute Knitted Gifts book for sometime and so I set to it the other night. 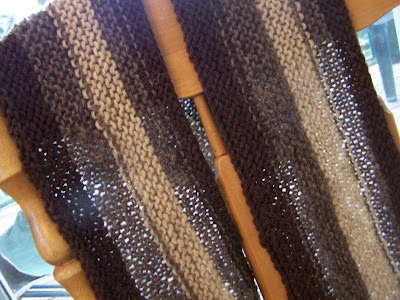 This knit up quickly and I was ready to bind off but then decided that I wanted to make the last two colour sections just a little wider than suggested so I went back and redid them adding two extra rows to each colour. I finished binding off this morning and am pleased with how it turned out. W agreed to try it on so I could take a photo. And now it waits on S's chair as a surprise when he gets home. Fun! 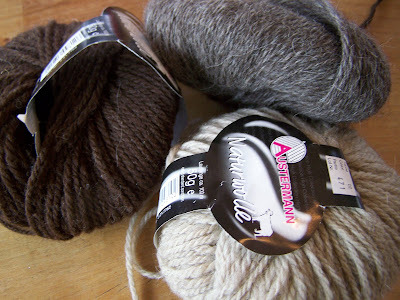 And did I mention I used up 3 balls of wool from my stash? 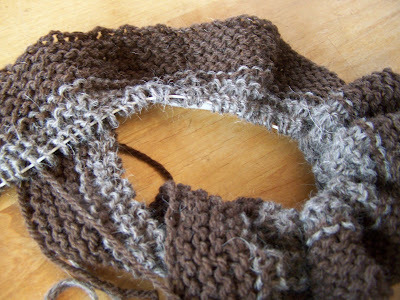 Now...those French Press Slippers use almost 2 skeins per pair...hmmmm. no no no! put it away for Christmas! truly! you'll be glad you did. i promise!!! Hi Lisa, glad to hear that nettle had such an effect on your energy levels too. I would love to take a workshop with Susun Weed, that would be wonderful, what fun for you. I love to garden and do grow loads of herbs. Right now we are in transition - we've sold our home and gardens in order to buy our "forever" home/farm and we are still looking at this point. So...in the meantime I have a small garden here in the woods and learn ever more about the wild plants that grow here. I very much look forward to getting my own huge gardens again...I miss them very much. If you are interested in seeing my old gardens you can find them on this blog if you look back before June of last year. and, so? did you leave the scarf out or squirrel it away? and what was the reaction (knowing the answer to question 1 ha ha)??? I love this scarf! I haven't tried a side-to-side scarf yet and the French Press Slippers are wayyyy down in my Rav queue. Heather, I drink a mixture of nettles, chamomile, and red raspberry for winter health. It's great. Hi Angie, I've just been working on my first pair of French Press Slippers, I hope they turn out as cute as the look online. Thanks for sharing your tea recipe, I've got a jar of it brewing now as I had those three things on hand. Yes, you know me...I did give it to him that day, I couldn't wait. He looks great in it.